Article from Reason by Jacob Sullum. Legislation aimed at improving background checks for gun buyers may be included in a must-pass spending bill that Congress is expected to approve tomorrow or Friday. The bill, which would encourage data sharing with the FBI’s National Instant Criminal Background Check System (NICS), has faced a surprising amount of resistance for a measure that has broad support among Republicans as well as Democrats and even has the backing of the National Rifle Association. Some of the resistance to the bill, known as the Fix NICS Act of 2017, is tactical. Democrats, perceiving an opportunity to enact broader gun control following last month’s mass shooting at a Florida high school, worry that if Fix NICS passes by itself, Congress will do nothing more. But there are also substantive concerns about Fix NICS that have been raised by supporters of gun rights, who rightly worry that it will help block firearm sales to people who pose no threat to others. Sen. John Cornyn (R-Texas) introduced Fix NICS last November in response to the mass shooting that killed 26 people at a church in Sutherland Springs, Texas. The perpetrator of that attack, Devin Kelley, had been convicted by a general court martial of assaulting his wife and stepson while serving in the Air Force, which disqualified him from owning guns under federal law. That record should have prevented Kelley from passing a background check when he bought the rifle he used in the attack, but the Air Force failed to share the information with NICS. Cornyn’s bill aims to prevent that sort of screw-up by requiring federal agencies to certify twice a year whether they are sharing “all relevant records” with NICS and submit plans for improving compliance. Agencies that fail to follow through on their plans would be ineligible for bonus pay. Fix NICS also would encourage sharing of local and state records, which the federal government cannot directly mandate without running afoul of the 10th Amendment, by giving agencies that demonstrate “substantial compliance” preference for Bureau of Justice Assistance grants. We might as well voted for Killary, at least she was telling the truth about destroying our country. Doesn’t this bill require President Trump to okay it. Why is he giving in to these rinos instead of sending these illegal bills back to the Congress and tell them to send him something that is legal and that he can sign. 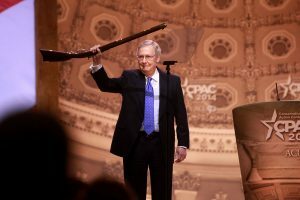 These democrats like McConnell are giving the democrats what they want, an in to keep on passing more and more bills until the Constitution is wiped out and the only ones having guns will be the gov’t military. If you come for our guns we will shoot to kill. Bloodbath! The Nationwide concealed carry reciprocity bill was included in the Fix NICS bill before NICS was included in the omnibus spending bill. WHAT HAPPENED TO CONCEALED CARRY RECIPROCITY?? Why and when was it dropped from the omnibus bill? Dems got All they wanted, Trump got his military funding increase, and the 2nd Amendment got screwed. RINOS sold out all gun owners. Why is that clown McConnell holding up an musket?